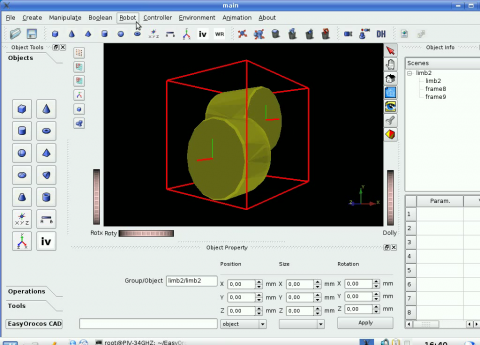 EasyOROCOS CAD is an interface which supports the interactive definition of a manipulator kinematics (and 3D geometry), and from that it generates an Orocos controller of the manipulator, in the form of a task running under Linux RTAI. Check out the EasyOrocos CAD website for animations that show these examples: how a link can be developed, how links can be assembled to build a new robot, and how the robot motion can be simulated. 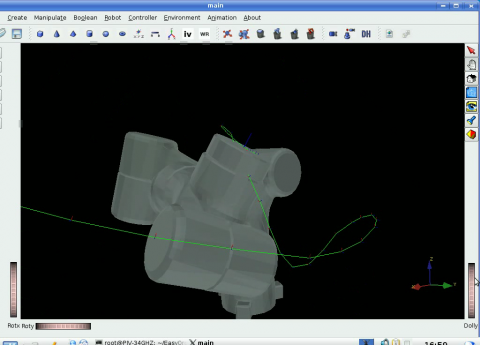 Simulating motion: The tool can simulate and generate the controller code for the real robot. Creating a Robotic link: Joints and links can be created for later re-use. The software is released under LGPL license. The authors invite their users to send an email to let them know they are interested in the software. NOTE: Requires Orocos RTT 1.4 or above. NOTE: Although this software uses kinematics, it does not (yet) use the Orocos Kinematics and Dynamics library. Submitted by Ruben Smits on Thu, 2009-10-22 06:55. How hard would it be to incorporate KDL?